In an apparent move to ingratiate itself with deal markets in India, Bank of America has named India's wealthiest person (and the world's ninth richest) to its board of directors. 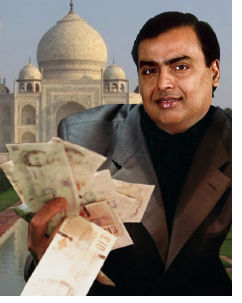 The appointment of Mukesh Ambani, the first non U.S. citizen named to the bank's board (and no doubt the one with the fattest pockets; his net worth is $27 billion), is expected to help BofA navigate the budding economy in India. It will give the bank a political ally, a business ally, and a direct line to landing those multi-billion-dollar infrastructure projects that India has vowed to undertake. Last year, BofA ranked eighth in both Indian M&A and Indian equity underwriting volume. It is BofA CEO Brian Moynihan's hope that the firm soon reaches the top five, at least, in those (and other) important investment banking categories. The move of naming a non-national to a board is becoming a more common one (both HSBC and Goldman Sachs have named foreigners to their boards in recent years) due to the fact that countries in the so-called BRICs (Brazil, Russia, India and China) are now hosting the fiercest battles for deals. All of the BRIC countries currently possess, and have been forecasted to maintain for some time, booming deal markets, whereas markets in the U.S. and Europe are, at the moment, luke warm at best. As a result, Wall Street's top banks have been mobilizing capital overseas and making personnel moves in hopes of boosting their international bottom lines. And given that landing deals in the BRICs relies so heavily on knowing whose hand to shake, banks not only need dealmakers who know how to close transactions, but also those with the ear of lawmakers who have the ability to source them.